Who invented the Paperclip? The name of the person credited with inventing the Paperclip is William D. Middlebrook (1846 - 1914). William D. Middlebrook is not only famous as the American inventor of the Paperclip but also as an engineer. When was the Paperclip invented? William D. Middlebrook invented the Paperclip in 1899, during the Second US Industrial Revolution / Victorian period of invention (1850 - 1914). William D. Middlebrook received patent number US 636272 on November 7, 1899 for his "Machine for making wire paper-clips". Definition of the Paperclip: The Paperclip is defined as a simple piece of office equipment consisting of a wire or plastic clip, bent into the shape of two almost-complete loops, for holding sheets of paper together by means of pressure. The Paperclip leaves the paper intact and can be easily removed. Fact 1: Who invented the Paperclip? The machine for producing the steel Paperclip was invented by William D. Middlebrook in 1899 during the Second US Industrial Revolution era of inventions (1850 - 1914). Fact 2: Who invented the Paperclip? The history of the paperclip dates back to 105 AD when a Chinese court official named Cai Lun significantly improved the existing form of paper and standardized the paper-making process, although it remained an expensive commodity for many years.. Fact 3: Who invented the Paperclip? The Industrial Revolution saw the rise of industrial paper mills which made inexpensive paper widely available. The rise of commerce and big business during this era resulted in masses of loose sheets of paperwork. Fact 4: Who invented the Paperclip? Prior to the invention of the Paperclip in 1899, iron wire pins were used to secure pieces of paper together but the iron pins rusted and left stains and holes in the papers they pressed together. Fact 5: Who invented the Paperclip? The Age of Steel emerged during the Second Industrial Revolution when Henry Bessemer invented Steel in 1855. Cheap, industrially produced steel wire was used for numerous objects such as rust-free hooks and safety pins. It wasn't long before someone had the idea of replacing the iron wire pins with pins made from steel and William D. Middlebrook was the man to capitalize on the idea. 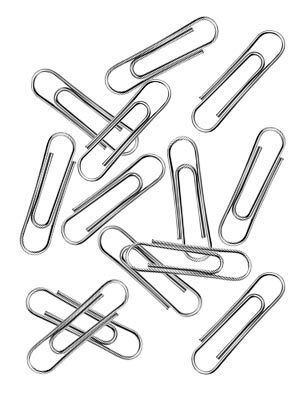 Fact 6: Who invented the Paperclip? William D. Middlebrook did not actually invent the paperclip - he invented a "Machine for making wire paper-clips" which made paperclips cheap and readily available to everyone. Fact 7: Who invented the Paperclip? The earliest patented clip, designed for attaching tickets to fabric, was called a Fay Clip and was patented by Samuel B. Fay in 1867. Charles Henry Gould invented the Stapler in 1868 and other types of clips, fasteners were patented by D. S. Gorman, Erlman J. Wright and Frank Angell. Fact 8: Who invented the Paperclip? The famous GEM paperclip was made of steel wire bent to a looped shape and most types of paper clips were variations of the shape. But it was William D. Middlebrook who commercialized the paperclip. Fact 9: Who invented the Paperclip? The man ultimately credited with the invention of the Paperclip, William D. Middlebrook, was born on March 19, 1846 in Newtown, Fairfield County, Connecticut, United States and died on August 29, 1914. Fact 10: Who invented the Paperclip? The early years of William D. Middlebrook were spent in Newtown, Fairfield County, Connecticut, United States where he was raised by his family. His parents were Sidney S. Middlebrook & Adaline Wooster. Fact 11: Who invented the Paperclip? William D. Middlebrook received a fairly basic education at local schools by developed a passion for all of the inventions of the Second Industrial Revolution and was fascinated by the Bessemer process for making steel. Fact 12: Who invented the Paperclip? William D. Middlebrook began working in engineering which led to his invention of the modern paperclip and a machine to make them. Fact 13: Who invented the Paperclip? William D. Middlebrook filed for a patent for his "Machine for making wire paper-clips" on April 27, 1899 and on November 7, 1899 he received patent number US 636272 for his invention. The Assignee name for the patent application was Cushman & Denison of New York. The detailed drawing that accompanied the patent application clearly shows an image of the double oval shape of the modern paperclip. Fact 14: Who invented the Paperclip? Cushman & Denison, a manufacturing company in the office supplies business, clearly demonstrated an interest in the invention at this point and went on to purchase the William D. Middlebrook patent at the end of 1899. Fact 15: Who invented the Paperclip? Cushman and Denison perfected the design of the paperclip by rounding the sharp points at the ends of the of the wire so the paper clip would not catch or tear the papers they held together. Fact 16: Who invented the Paperclip? Cushman and Denison also trademarked the name "GEM" in connection with paperclips in 1899. By 1907, the Gem brand of paperclip was the most popular of its type in the world and were supplied in distinctive small, black boxes. Fact 17: Who invented the Paperclip? Advertisements for the GEM Paperclips stated that they "will hold securely your letters, documents, or memoranda without perforation or mutilation until you wish to release them." Fact 18: Who invented the Paperclip? William D. Middlebrook died on August 29, 1914 and was buried at the Evergreen Cemetery, Watertown, Litchfield County, Connecticut. The paperclip is still in use to this day, despite the "paperless office".